When work is all consuming, deadline, product launching madness, it is a guilty godsend that I signed up for a painting workshop a year ago and just had to escape to the Sierra Foothills for a long weekend. Thank you self for being a planner! Also incredibly relieved that I actually, physically, can paint right now... Just barely. This is another long story, but I shredded and partially tore my right rotator cuff a couple of months ago and thanks to PT and acupuncture I am finally FINALLY able to move my arm! So off I went to Murphys. A terrific little town that has a Gold Rush history and a wine country renaissance. The workshop was with Kathleen Dunphy, who has the rare talent for being a terrific painter AND a really good instructor. On the agenda for weekend learnings: painting with a limited palette and using only big brushes. Harder to handle for me was getting used to a #10 brush on an 8x10 panel! You have to really move your arm around to achieve different strokes and line weights, which might normally be fine but when you have a gimpy arm... It was not ideal. 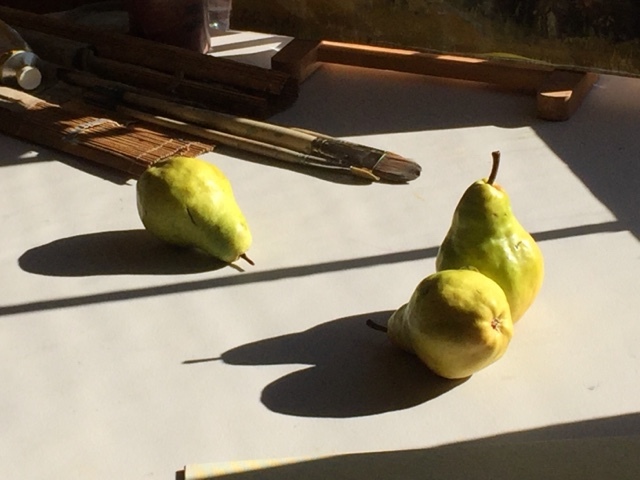 First day of the workshop was a lot of good lecture and learning to mix paints and an indoor still life study of pears.